What does it mean when, over a single year, the number of people who come to LibrePlanet more than doubles? It means that the free software movement is strong and growing. It means we have a fighting chance to protect our freedom and privacy in the digital world, and that we are inspiring new people to join us. Wikimedia executive director Sue Gardner kicked off the conference with a call for the free software movement to become bigger and bolder than ever. Almost four hundred people attended, including fifty-four presenters, 40% of whom were women. NSA-revealer and privacy hacker Jacob Appelbaum gave a remote keynote via videochat, using Tor to anonymize his location. Watch the recording and stay tuned for more videos from the conference soon. 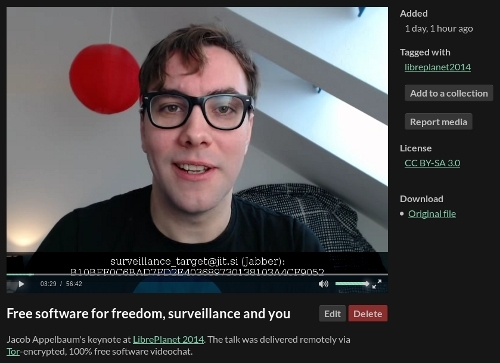 Watch the recording of Jacob Appelbaum's remote keynote, "Free software for freedom, surveillance and you. Ten free software businesses and organizations strutted their stuff at LibrePlanet's first exhibit hall. Members of the free software community welcomed newcomers and reaffirmed old friendships at a diverse array of social events. At the Saturday night mixer, Lulzbot raffled one of their Respects Your Freedom-certified Taz 3 3D printers. GNOME executive director Karen Sandler called on free software projects to use their messaging to give people of all backgrounds a reason to participate. At peak, more than three hundred people participated online through our free software livestreaming system. Richard Stallman addressed the importance of free mobile devices, and Eben Moglen issued a rallying cry to finish the fight against software patents. MIT student group SIPB co-organized the conference, reaffirming the free software movement's historic relationship with the university. The FSF presented the GNOME Outreach Program for Women with the Award for Projects of Social Benefit, and Matthew Garrett with the Award for the Advancement of Free Software for his work against Restricted Boot. Read the Free Software Awards press release. Twenty-eight dedicated volunteers made the conference possible. Thank GNU to Seda Akay Onur, Krista Allen, L. Brockman, Julian Daich, Ian Denhardt, Patrick Engelman, Daniel Fitzmartin, Casey Friedman, Cynthia Frommit, Emily Gonyer, Ian Gustafson, Shaun Will Hallee, Matt Hins, Malcolm Inglis, Timothy Jordan, William Kahn-Greene, Brendan Kidwell, Bassam Kurdali, Daniel Levine, Jon Littlefield, M. C. McGrath, Bram Oosten, Guillermo Perez Mayorga, Scott Reeve, Emily Savelli, Karen Tang, and Diane Williams, as well as rsiddharth for building our most beautiful Web site ever. If you're interested in volunteering next year (you'll receive gratis admission and a t-shirt), please send an email to resources@fsf.org. With the awesome community that was built and strengthened at LibrePlanet 2014, we can't wait to see what next year will bring. If you'd like us to let you know when registration opens, join the LibrePlanet 2015 announcements list today. Remember that becoming an FSF member gets you gratis admission to the conference, and bragging rights for supporting the FSF's work year-round.